I want someone to shake my hand first. Or Sandy’s. Or Jordan’s. We go to City Hall, General Services Department, local business; we talk to counsel members, government employees, business owners. I make eye contact, introduce myself, have my hand ready, and somehow it never happens; our team’s two male riders always seem to get the first shake. Climate summer is made up of 31 riders. Five are male and twenty-six are female. My group, however, has two male and three female students, making us the most equally divided team in the program. When I began Climate Summer, I had no idea that gender, sexism, or gender inequality would have any relevance to the work I would be doing. But despite the fact that our program is 84% female, the climate leaders that most people think of first are Al Gore or Bill McKibben, not Rachel Carson. And likewise, the hands shaken first on our team are almost always male. Before I continue, I’d like to say, this post is not meant in any way to express negative feelings toward Ben or Van, the two male riders on our team. They are fantastic. Nor is it to criticize anyone we’ve met over the course of our travels. But I do believe there is an interesting, and subtle, form of inequality within this movement, and all I’d like to do is ponder it aloud. We come across many people in this program working toward sustainability: farmers, gardeners, business owners, government employees, activists, environmental group leaders, students, and more. Naturally, we see both men and women within these fields, yet somehow, almost every business owner or municipal employee we meet is male and six out of seven of our lead contacts this summer are men. Even last night when we attended a documentary screening, all four highly respected panelists were male. The movement away from fossil fuels is not disproportionately male in terms of supporters, so why this disparity in leadership? Why are the people making the large-scale, city-wide decisions about energy use, or the people producing the films or running the businesses that are making a difference, so often male, and is this a problem? Though I am trying to focus simply on the important work we are doing and interesting people we are meeting, I find it difficult not to become frustrated with both how few women I see in positions of influence, as well as how we are treated as female students in a coed group. 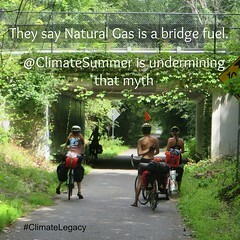 I do not believe I have met anyone this summer who is intentionally sexist, but I can count numerous times in which a person didn’t look at Sandy, Jordan or I once while describing their work, or who gained a considerably more condescending and slow tone when describing a fossil-fuel concept to me, as opposed to the male riders on my team. And as I said earlier, shaking the hands of us three girls generally seems like an afterthought. Maybe I’m being oversensitive, or perhaps this is a real concern that’s felt throughout the Climate Movement. 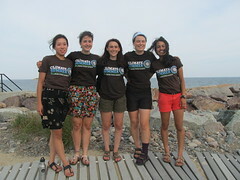 New England Climate Summer has twenty six amazing, competent young women fighting for a more just future, and I hope that as we continue to work toward a greener world, we are also building a movement that allows for strong, female leaders who will help shape the direction of this country’s energy usage. I’ll end with a request. 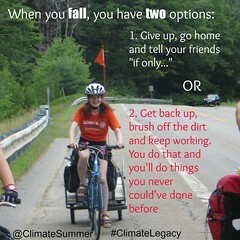 When you meet the New Hampshire Climate Summer Team, speak to Jordan, Sandy, and me directly. Look us in the eye. Trust that we understand what you’re saying just as well as Ben and Van, and that we are just as familiar with BTUs and Joules and schematics and any other technical words you throw our way. And please don’t shake our hands last. 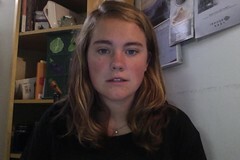 This entry was posted in Uncategorized and tagged environmental movement, equality, gender, New Hampshire, women. Bookmark the permalink. You go Bryna! You will/are one of those strong female youth leaders and you need to keep making your voice heard! You make women proud! Bryna – thanks for saying what you said. Oftentimes, sexism or other isms are subtle and not explicit, but the effect is the same. It divides instead of unites. And we all know the very important work you’re doing needs unity. I hope when we meet again, we look each other in the eye and know what a difference you made! Perhaps because of the areas we’ve been in, Mass Action has noticed that the environmental groups we interact with tend to be dominated by women, at least in terms of numbers. And yet, as Ale said, we also often get the question: why aren’t there any guys on your team? I wonder if our team were all males, if people would ask the question the other way: why aren’t there any women? Thank you for sharing your experience, Bryna! I hope that people really listen to what you are saying and look you in the eye when you speak, because what you have to say is powerful. We’ve also had quite a few questions as to why there weren’t any males in our teams, some of which were worded as it if were a bad thing. Why can’t 5 females be as valuable to the movement as 5 males? or as 3 females and 2 males? Thank you for this post Bryna, you did a really good job of putting into words what I have been feeling throughout the summer! Thanks, Bryna. You’ve written so powerfully & thoughtfully about an enduring, rampant problem. It *is* a real concern throughout the climate movement (and beyond) – but all too often people who raise this issue are branded with the “oversensitive” label. Thanks for being bold & addressing this head-on, while being so gentle and loving about the people you’ve encountered. I think you’re right – most people don’t mean to be this way. It’s just so deeply ingrained. As a man, I can’t even count the number of times a guy has turned to me while I’m quietly sitting in a meeting to ask, “Sean, what do you think?” – WHILE multiple women have been raising their hands or trying to get their voices heard THE ENTIRE TIME in a male-dominated meeting. And when I call men on it, they’re like, “What?” I think they’re just not thinking (about sexism & gender imbalance). If I could add to your request, I’d ask that people follow your lead and start kindly pointing out when others are being sexist, exclusionary, etc. – most of us don’t mean to be, and could use help in getting back on the path toward justice & equality. Keep on naming the hard truths and the intersections of injustices – and offering helpful suggestions/requests for improving the status quo. This post was awesome!! That’s when I realized why I was getting so out of sorts! If we are truly working to build a better future, then we have to build the whole thing (and not just assume that things like gender dynamics will fall into place the way we want them to). Gender justice and equality are not part of the social structures into which most of us are socialized, and so it can be difficult to imagine a world where women are truly treated as equals to men. Our current reality will only change when we deliberately re-make our social structures with all kinds of justice and equality (including gender) at the forefront of our intentions, strategies, and goals. 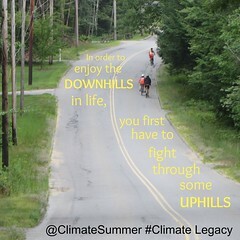 Don’t let anybody tell you we can save the world from fossil fuels and then go back to save it again from social injustice… We make the road by walking (or pedaling). The future we build will be defined by the way that we traveled together on the journey. Of course, as you point out, almost nobody excludes or demeans women intentionally. Thanks for raising this in a way that makes it clear that we’re all in this together and that we need to be aware of the ways that we interact with others. You don’t know me, but I’m Sandy’s roommate, so I read the blog, and I really enjoyed this post. I’m currently interning at Greenpeace and working a lot with the Chicago Clean Power Coalition (Sandy can explain), and we have so many leading female activists, that I hadn’t given this much thought until now. However, when I think about it, it does exist. Our primary contact with the mayor’s office is male, and so are most of the aldermen. However, the movement itself has many more women than men, yet those women need to work harder to make their voices heard. How many prominent works on environmental issues are written by women? Thank you for bringing up this issue, and for making me think about the way it affects my own life. I hope your hand gets shaken first next time! I think you are spot on about naming these important gender dynamics that still operate in many social movements as well as in the general culture. Thanks for naming this so clearly–and for making a very useful request about how folks should engage with young women leaders in this movement. Thanks for your insights. I would just like to say thank you for writing this! As you know, I agree with most of your concerns about gender roles. It’s frustrating that in this day and age there are numerous examples of subtle, and in my opinion, often unconscious, sexism. I am grateful to all the people who have agreed to meet with our team throughout this summer, but I do wish that I felt as if my opinions, my questions, and my very presence was more respected. I think there is a continuous battle being fought by those who are young to have their voices heard, and it seems even more difficult for women, particularly in the climate movement, to gain the respect they deserve. Thanks for your post Bryna! Looking forward to hearing others thoughts!